This is an image of the Pier 34 show. Guerrilla art shows that took place in unused City of NY buildings such as the Real Estate Show, or the Times Square Show that was held in an abandoned massage parlor, are examples of art collectives creating alternatives to the staid, exclusionary spaces of museums and galleries. They took the concept a step further with shows that were intentionally disposable, often leaving the artwork behind to be destroyed with the condemned buildings. The Pier 34 show organized by David Wojnarowicz and Mike Bidlo was the apex of this artistic protest, with the murals, stencil, and graffiti paintings literally crumbling into the Hudson River as the decayed waterfront was left to rot by a corrupt and indifferent city government. 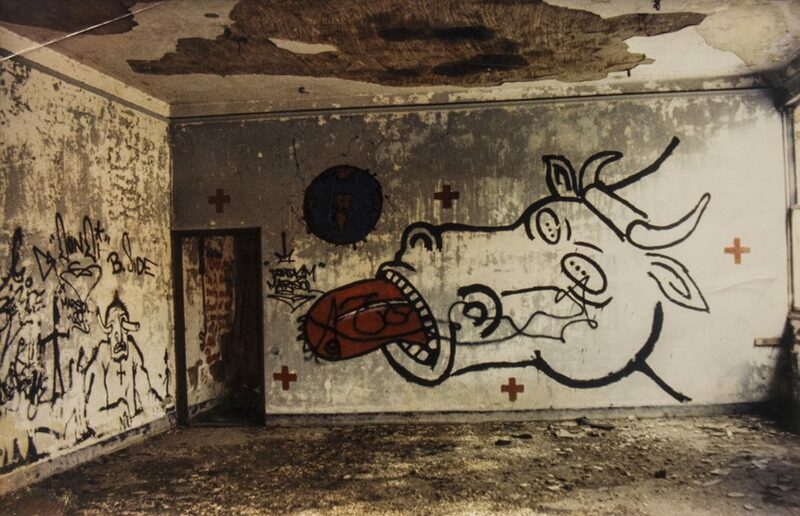 This photograph offers one of the few examples that remain of Wojnarowicz’s amazing contribution to the exhibition.